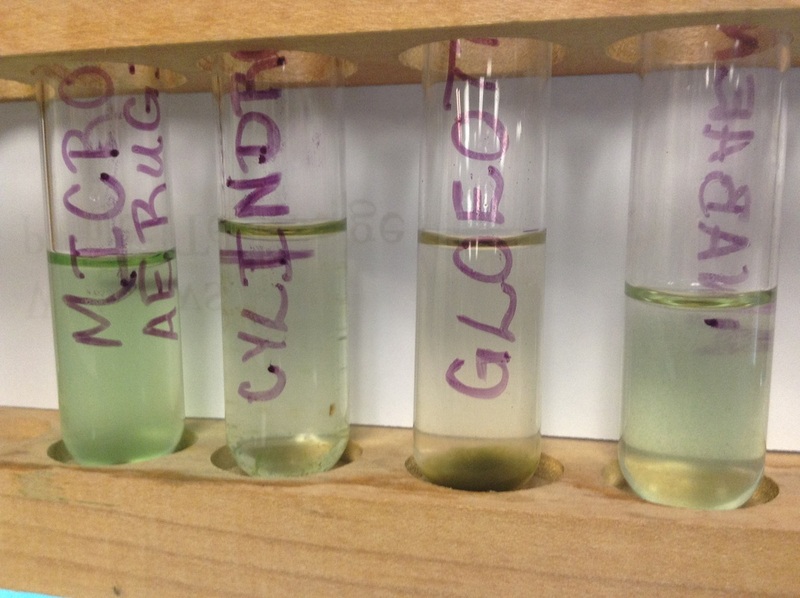 Based on our Twitter and Email conversations with researcher and specialist, Jonathan Puddick, we decided to test our Tag-Team Champions (Daphnia and Amphipods) effectiveness in consuming specific forms of cyanobacteria. 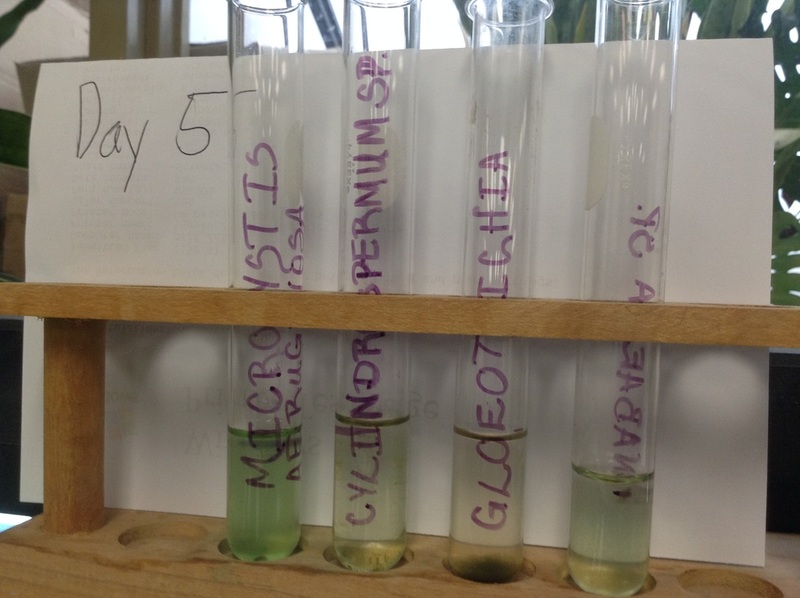 We utilized several sources of literature to determine the most common forms of toxic cyanobacteria. After research, we identified cultures available on the internet and asked our teachers to order them for us. 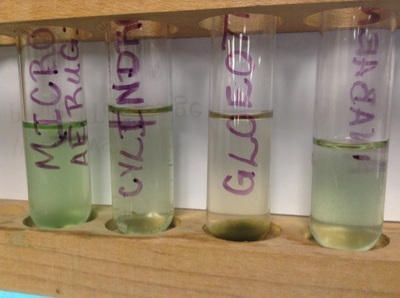 ﻿Our initial plan was to test the daphnia in all six of our cyanobacteria cultures. 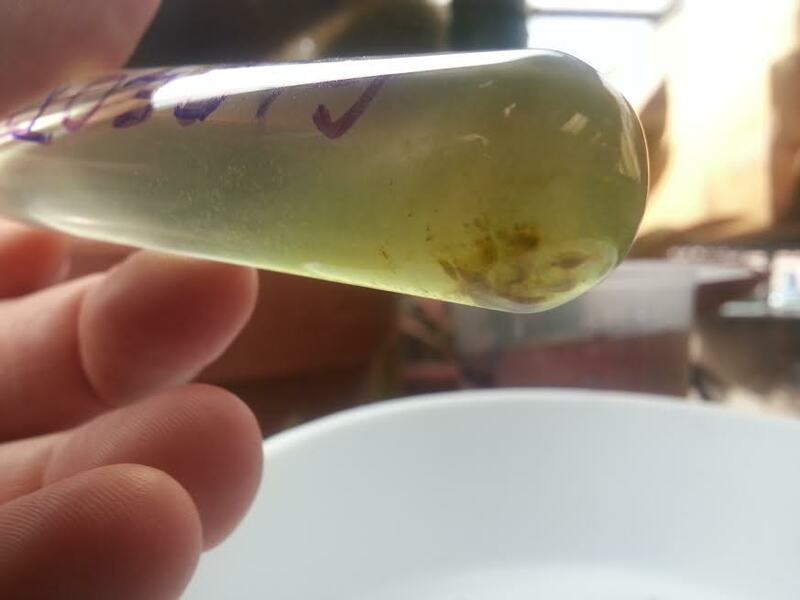 When they arrived we noticed that two of the cultures contained cyanobacteria that was very dense and settled on the bottom of the test tube (Lyngbya and Oscillatoria tenius). We determined that this type would not be best for daphnia so we began our test with the four other cultures that had cyanobacteria throughout the entire test tube. 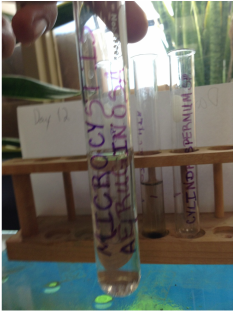 Day 1 is the day that we set up the the test tubes and experiment. 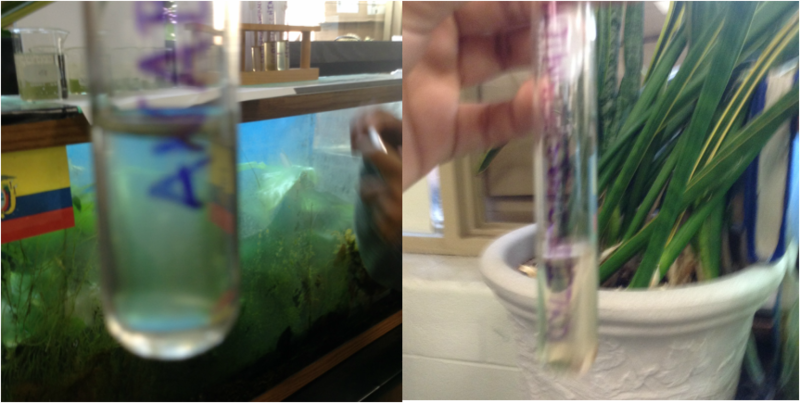 ﻿In all four test tubes we placed two of our daphnia with one amphipod. 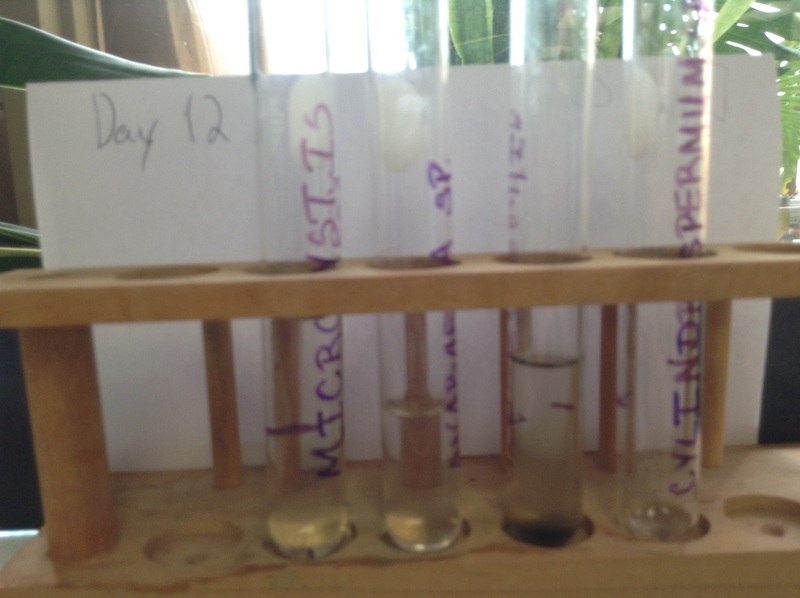 On Day 2 of testing we noticed that the cyanobacteria in two of the cultures (Gloeotrichia and Anabaena) settled to the bottom of the test tube so we decided to involve amphipods in our test. 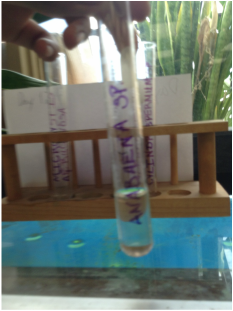 In all four test tubes we placed two of our daphnia with one amphipod. 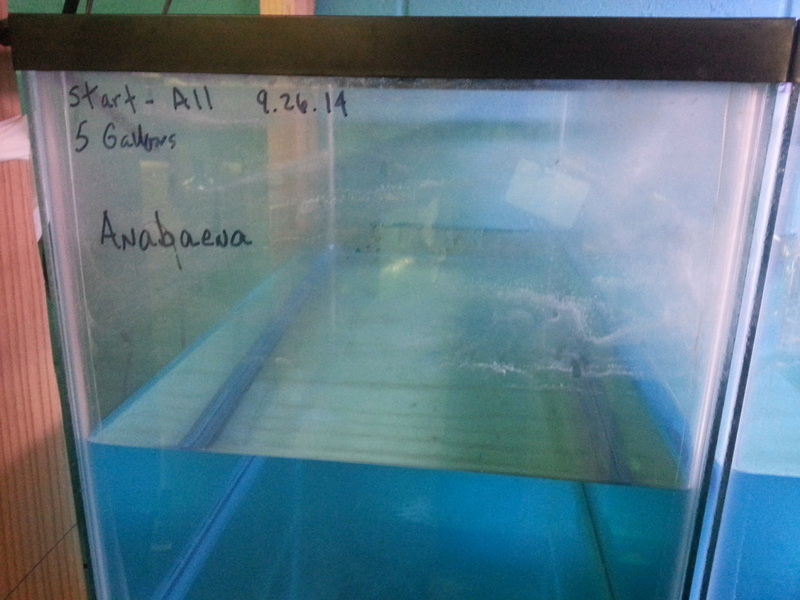 The amphipod and daphnia we placed in were all alive on day seven. Both amphipod are alive but one of the amphipod seems rather weak, the daphnia on the other hand is doing well. Both of the two amphipod and one daphnia are alive. Very dense algae. 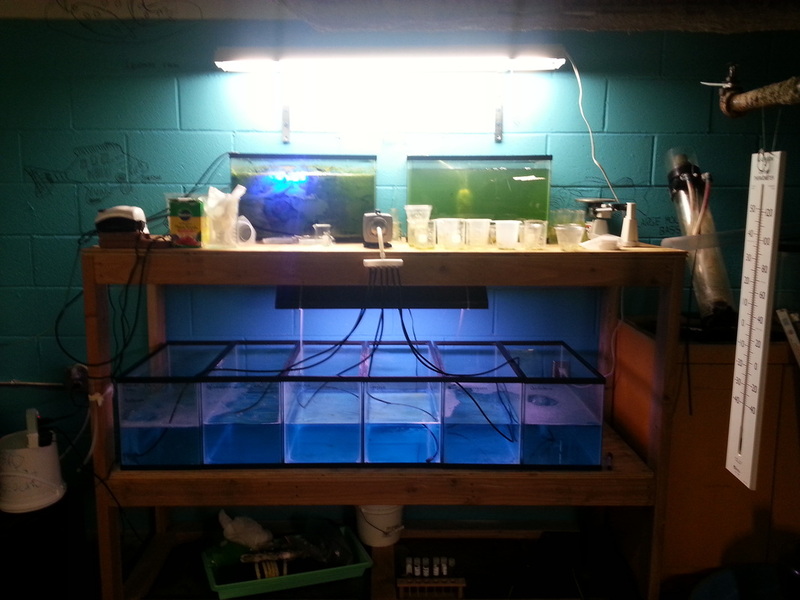 We added more amphipods to fix this issue. 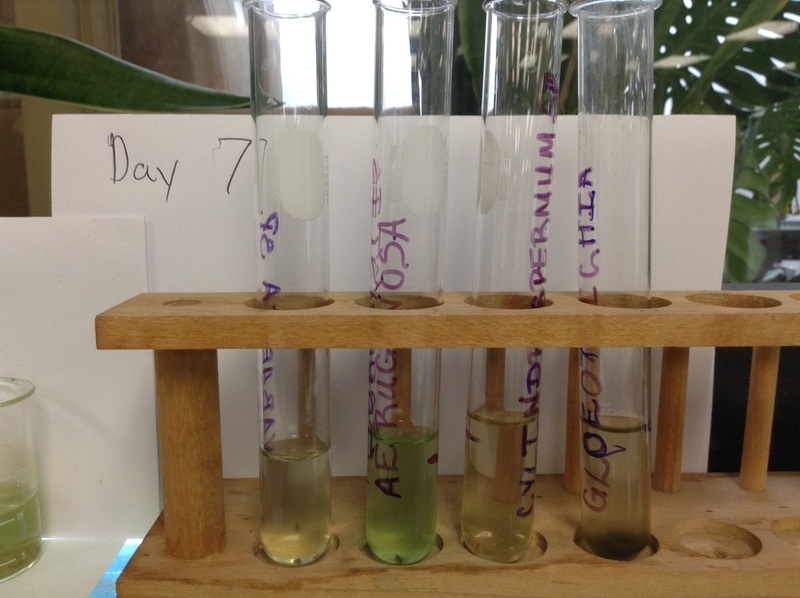 In a matter of (less than) two weeks, the Daphnia and Amphipod tag team cleaned out 3mL of the Microcystis aeruginosa species of algae and the Abaena sp. 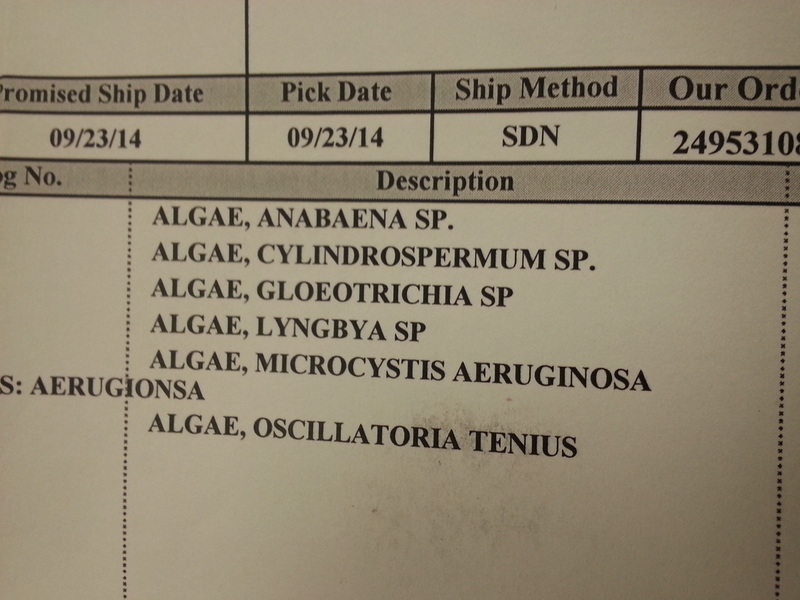 of algae. 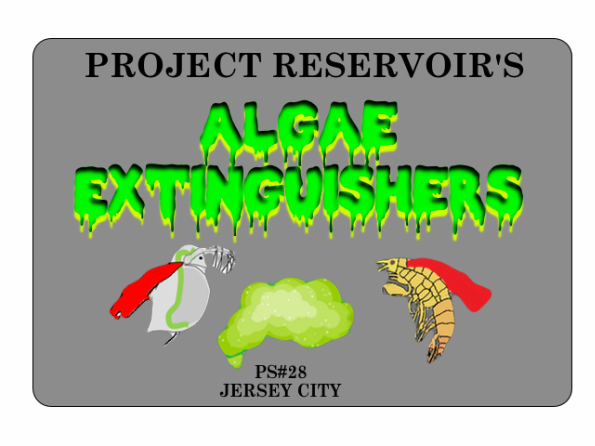 Imagine what this duo could do to a whole pond or lake! 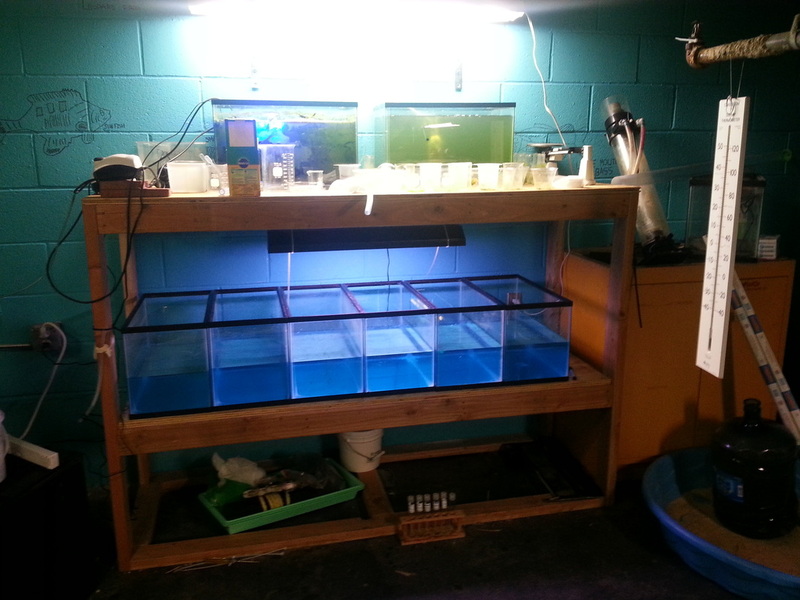 We added 10 amphipod to speed up the process. If you look at the bottom you can see the dead amphipods. 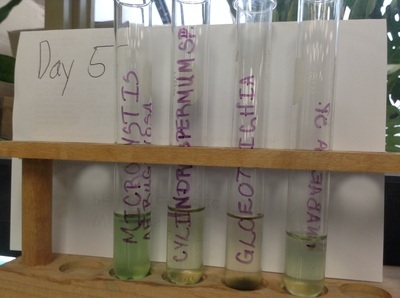 On day 13 Kevin checked the Gloeotririchia, and he realized that something was wrong. 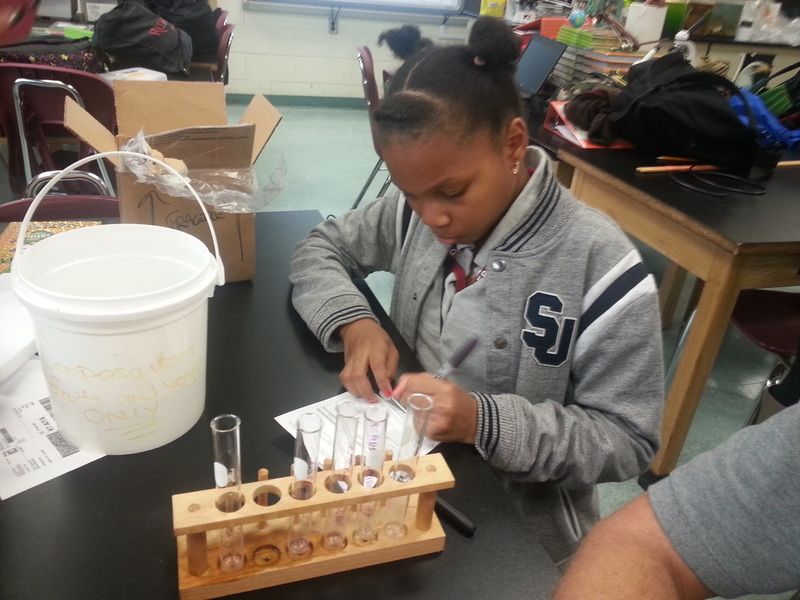 When he looked, he didn't see anything moving so he consulted with one of our mentors (Mr. O'D) to make sure that that the Amphipods we placed inside were dead and sure enough ... all 10 were dead. We hope to send a sample of the Gloeotrichia to a lad in New Zealand to find out how toxic is it. 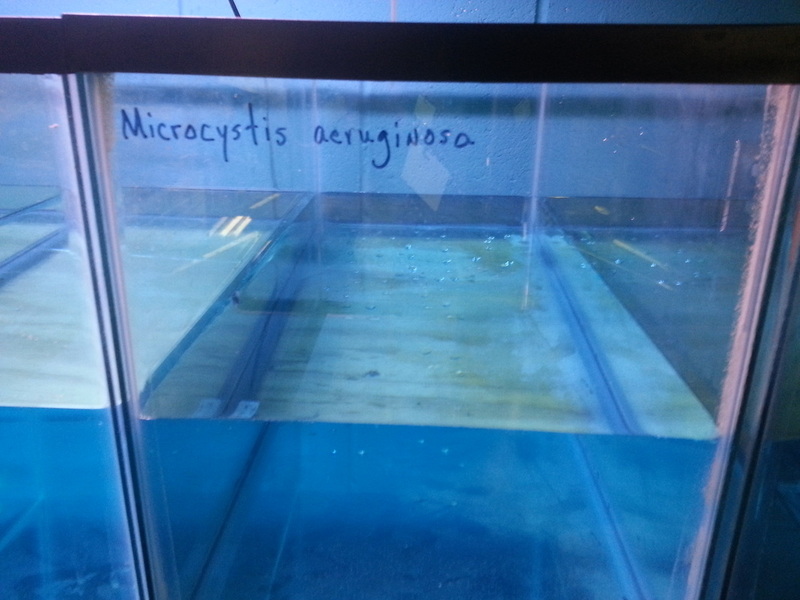 To assure that we would have cyanobacteria available for additional testing we saved and created a culturing tank for each of our six purchased cyanobacteria. 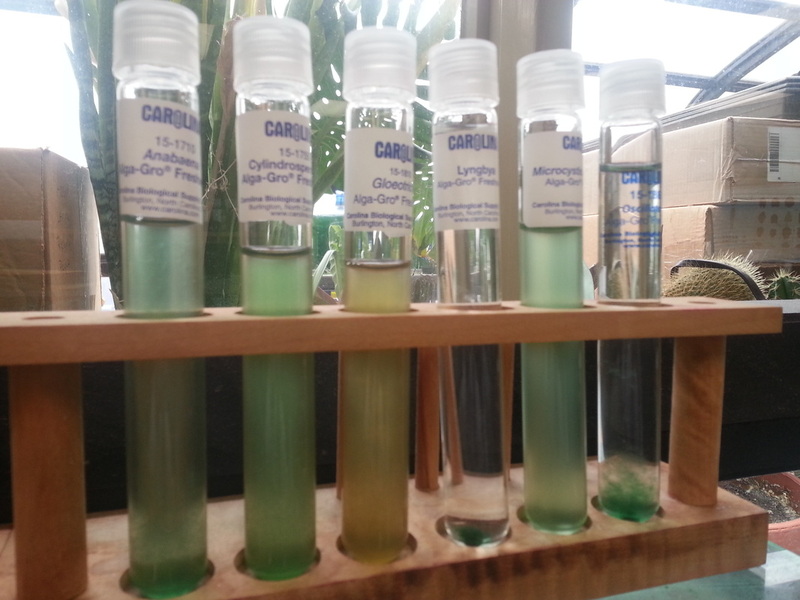 Each cyanobacteria will be cultured in 5 gallons of nutrient rich, aerated water. Lighting is currently on a 24 hour cycle. 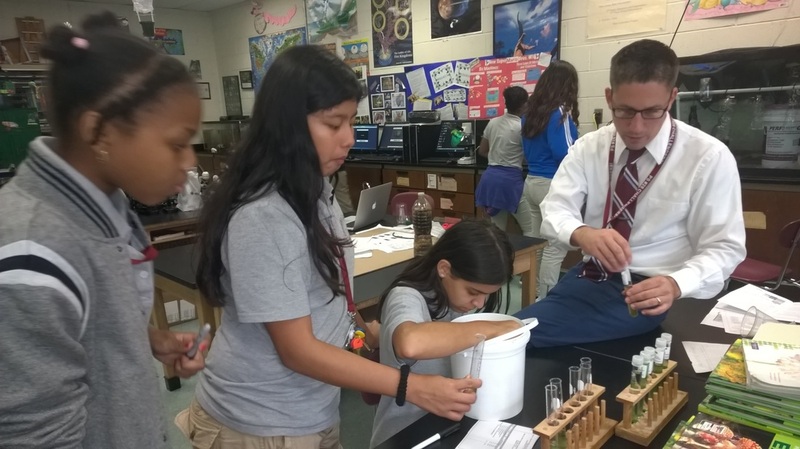 We asked Mr. Puddick how he determines if a sample of a specific cyanobacteria is toxic and this was his response, "We test the Cyanobacteria for the genes required for toxin production and for the toxins themselves." Considering we have no means of doing these tests we are considering the cyanobacteria to be toxic and treating it as such.